There are stages of any movement, and make no mistake, the shift to participatory medicine is a social movement, a full-bore cultural movement. It’s a change in roles, a change in expectations, a change in beliefs about the validity of a new party’s perspective – in this case, the patient’s. I’m fond of pointing out milestones, the turning points in our movement. One was the founding of the Society for Participatory Medicine in 2009. Another was when patient voices started to be invited to speak about patient issues in Washington policy meetings. Another was when the Institute of Medicine said in 2012 that a cornerstone of medicine must be “Patient/Clinician Partnerships” with “Engaged, empowered patients.” Then the OpenNotes project, the BMJ editors announcing their Patient Advisory Panel, the founding of the Patient Voice Institute last year … all are signs of the movement maturing and gaining acceptance in the establishment. Today I’m thrilled to announce a small but significant step in another dimension: NEHI, the Network for Excellence in Health Innovation, has offered me a Fellowship in Patient Engagement – a part time six-month project, advising them about patient perspectives. Here’s NEHI’s vision map – click it to visit their site. 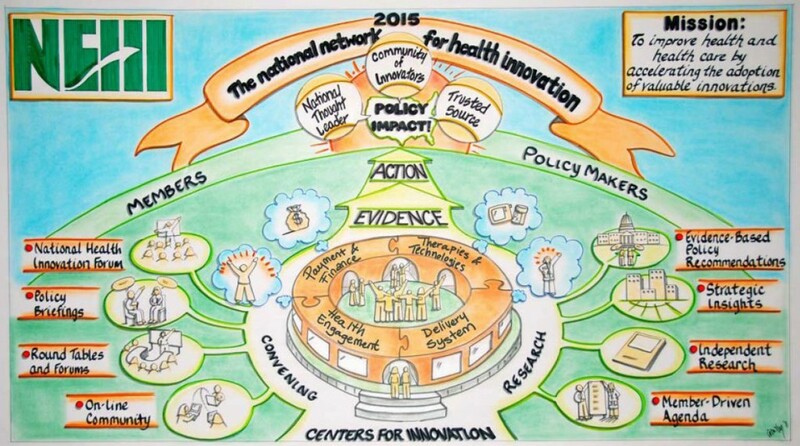 And note what’s at the top of the circle: Evidence, Action, and Policy Impact. My kind of people! Now the work starts. May this be the start of many such initiatives in many organizations that focus on improving healthcare! For the record, here’s the 55 minute video of my keynote at NEHI’s 2013 annual meeting … as it says at the outset, this was a new approach: a new beginning and a new ending. Thank you, NEHI, for your vision, and let’s do this thing! So you can imagine how thrilled I am that Brown University in Providence, R.I. is supporting a first-of-its-kind grass roots event next Monday night, attached to a session I’m teaching the next day for one of their courses. Crisis care – patients or caregivers who step up in a crisis and do everything they can to help, exemplified here by Pat Mastors (@PMastors). These cases are all very different but they have a common thread: when patients get activated they can make a huge difference. This event all came together very quickly, so I apologize for the last minute nature of this notice. If you can come, that’ll be great. In any case, feel free to download this PDF or just send people this link. If this gets great reviews, I hope to do more. If it doesn’t, we’ll fix it. Because from now on it’s “game on” – let the change take root! The course where I’m speaking is Brown’s Executive Master in Healthcare Leadership program – a year-long course for mid-career executives. Tuesday is their final session of the course. Thank you to Angela Sherwin and Judith Bentkover for their vision, and to Brown’s program for helping make this happen! I could say a lot about the time I spent working with them. Their CEO David Pate had heard me speak a year earlier at a small CEO roundtable, and subscribed to this blog. When I posted my RFP for my skin cancer, he wrote and said “I’ve got a proposition. 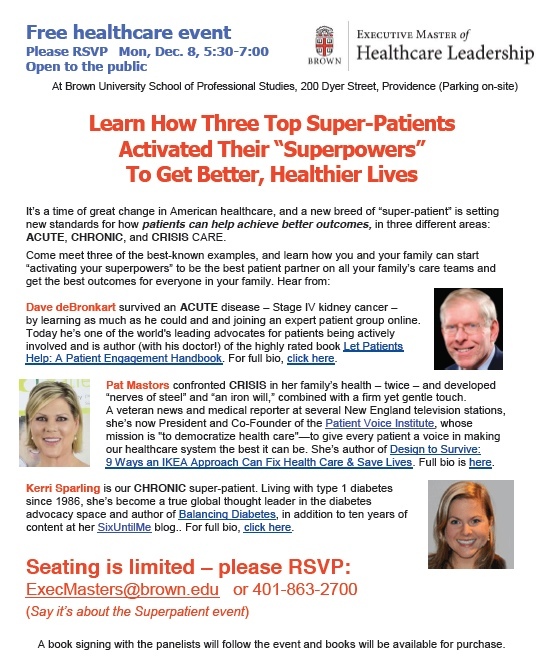 Come do your talk as Grand Rounds, and we’ll do the surgery for free.” I said “Thanks but no thanks – but since you asked…” and we started a discussion that led to a multi-day engagement, working with their leadership team and giving a keynote to a big leadership meeting last winter. I subscribed to his blog too, and in today’s feed is a fascinating story: Learning from the 20th President. 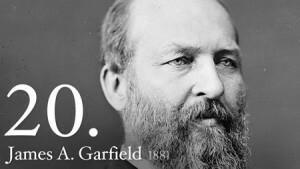 That president was Garfield, who died 132 years ago. He was shot, but the bullet didn’t kill him – an infection did, months later, almost certainly caused by the stream of doctors who stuck their unwashed fingers and tools in him to try to find the bullet.